“It sounds like we’re at an AA gathering – alcoholics anonymous”, someone remarked last week during a discussion on ‘purpose-driven communications’, “so maybe I should acknowledge that we have Shell as a client.” Our conversation, at a session during the European Communication Summit in Brussels, had slowly moved onto the slippery slope of ‘good, not-so-good, bad’, and the ethics of working for tobacco, weapons or the fossil fuel industry. Can one be purpose oriented and work for a ‘bad’ industry? What do we mean by ethical behaviour? Are profit and purpose contradictory terms? Much depends on the definition of purpose and this is clearly a personal decision for each individual. 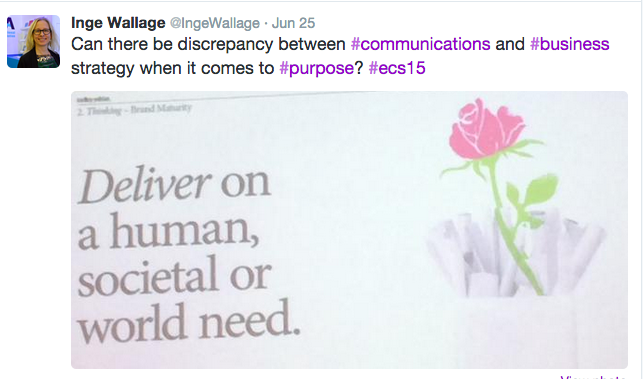 At an earlier session that same day, purpose had been defined as the ‘delivery on a human, societal or world need’. Yet when I asked whether that would exclude working for particular companies I didn’t get an answer. The conversation that we engaged in is a meaningful one. ‘Purpose minded’ people had obviously decided to join the conversation. We sat in a circle and listened to each other. We did not address the latest techniques and innovation in communications, but talked about us, us as communications professionals, as human beings and our values. People seemed to appreciate that communications as a function has amazing power, with which comes a certain responsibility. For example, we felt we have a responsibility to ‘hold up a mirror’ to those we work for and with. Those of us who believe we are accountable to a larger purpose (including future generations and the sustainability of the planet) are also the ones to handle power in the right (read ‘non-corrupted’) way. We did not decide a particular way forward, but acknowledged we need to continue our discussion on what purpose means and the way we should put it into practice. Purpose to me is when one works for something larger than self and the boss or organisation one is accountable to. Purpose means one has realised there is a greater responsibility we have to society and our planet. Staying true to that is a huge responsibility and something that I find daunting. However, striving for it is important, I think. I hope you will (continue to) join me on that journey. My great communication colleague, Philippe Borremans, participated in the session and interviewed me straight afterwards. I believe our conversation captures the session very well – I am very grateful to him – and I would like to invite you to listen. Please do share your comments with us. ← Do purpose driven communications have a future?